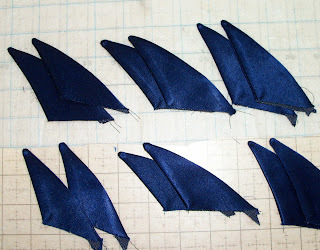 But let’s get on with learning how to make perfectly pointy fins for our Bat gloves. A is for Accuracy….seriously you need to pay careful attention to the details. The first is your grain line. 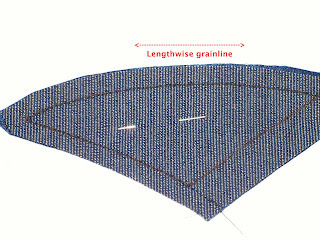 The ribbed texture you can see on the wrong side of the fabric is the cross grain(stretch). The yellow is indicating that, but it is not aligned quite right as the right end is slanting down a bit. Can you see it? I created a copy of the fin pattern piece using template plastic. Your pattern piece should not have any seam allowance on it. Trace around the pattern with a fine(that’s important) sharpy. Equally important is making sure that the cross grain runs straight across the tip of your fin. Remember there is no stretch on the lengthwise grain. All 3 fins are the same, but they are placed into the gauntlet at different depths, and angles. You will also notice that they are not…I repeat not interfaced. This surprised me when I observed it on the original set. The Williams Studio 2 pattern will provide you with a template for the proper placement, as well as angle and depth for each fin. 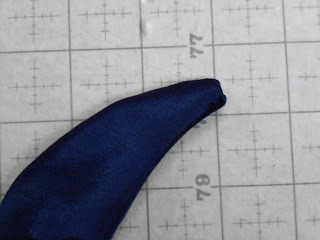 You can make 3 separate fin patterns based on that template, or you can make 1 pattern and adjust after sewing. 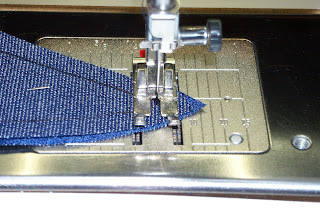 Set your machine up with a sharp #10 needle and set the stitch length to just below 2. 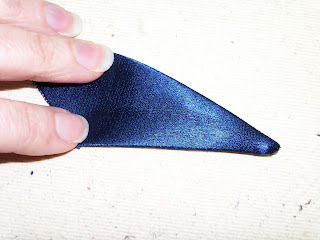 A small stitch helps you sew with better accuracy around curves and especially around the tip of the fin. Stitch along the inside edge of your stitch line another point of accuracy. When you get to the tip, put your needle down and pivot one stitch across the tip, with needle down pivot again to continue along your stitch line. 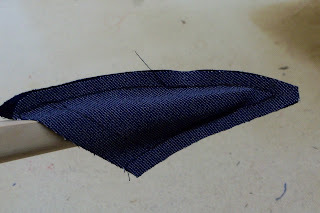 You are stitching only along your curved edges, keeping the bottom open for turning. 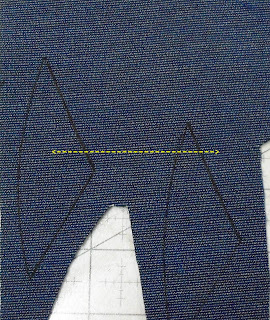 Fray Check both sides of each tip around the outside edge of stitching. 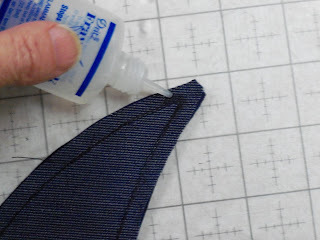 This prevents the fabric from fraying out after you clip and turn. You will need a quality point board for this next step. 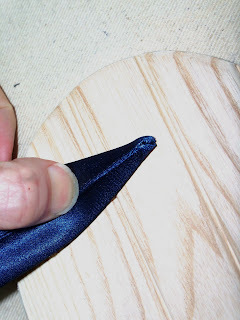 After pressing your fin flat to marry the stitches into the fabric, place it onto a point board and press your seams open. 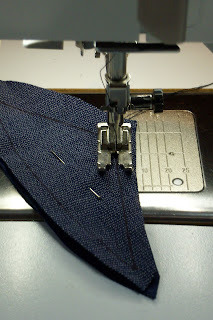 Trim back your seam allowance at the tip very close to the stitching. 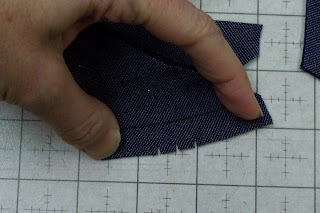 Don’t try to trim both seam allowances together, but trim them individually, so that you can see where the stitching is. I can highly recommend reading glasses for this and the following steps. 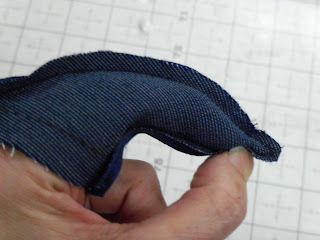 Put your index finger inside the fin and pinch the fabric in between with your thumb…. Invert the fin over your thumb. I imagine that if you had lovely tapered thumbs you will have greater success with this step then I do, but it works all the same. 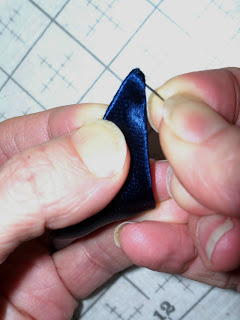 Again very carefully take a sturdy pin and pry up the point a bit more until you see your full tip. Now for the pressing. This 1st step may surprise you, but you want to flatten your tip aggressively. With the inside curved seam facing you and the outer curved seam directly underneath it, lay it down on a clapper, or piece of hard wood. Press just the tip with a hot iron and count to …at least 5. 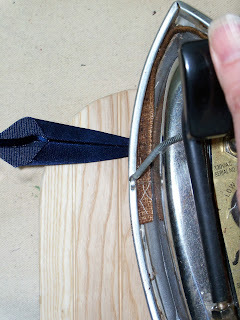 Pressing on top of the wood will really flatten your seam and smooth out the bulk in the tip. Press your fin again this time to finish. You need to have 6 finished fins. Chuck has two sets of gloves and so I made 12 fins. Actually I made about 18 fins to end up with my required 12. I hope that this tutorial has been helpful to you. 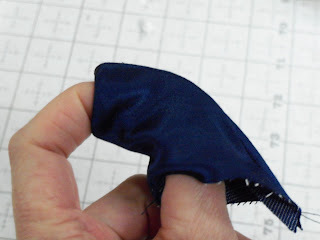 Even if you never make fins for Batman gloves these pointers should prove helpful for making tight corners or collar points with stretch fabrics.